Secretista: Do you/would you bleach your skin? Do you/would you bleach your skin? I LOVE my milk chocolate skin tone. Mmm; I taste and look so good, I make you want to say "Hershey is" when I walk into a room... Ha! The idea of bleaching skin actually sickens me. Every time I think about it, I revert back to my freshman year of college where I learned about skin bleaching via my Anthropology Race & Ethics class (WATCH: A Girl Like Me). In some black communities and countries like Jamaica and Thailand, skin bleaching is common. It has to do with the idea of beauty and lighter skin being more desirable. This obsession with whiter skin can be traced back to times where those who were considered farmers had a lower status and tended to be darker from being in the sun all day (i.e., slaves and farmers/peasants from ancient China). Thus, having lighter skin is now a way to define ones status in a world with no definite cast system. So anyway, a recent visit to my new Dermatologist changed my mind (slightly) about skin bleaching. Anxious about meeting my new doctor for the first time, I was ready to see him and go back to using my daily facial regiments. You see, I ran into some health insurance issues and stopped using my normal prescribed products completely (eek! ), causing me to breakout like I was some prepubescent teen. HELLO, I'M 21! Since I was 10 years old, I've been going to a Dermatologist. I've also been using the same acne meds for 10 years. About 90% of my skin care products aren't over-the-counter and since I have sensitive skin, I don't have the luxury of trying all the fun less-expensive-than-prescription topicals. During my consultation there was talk about pills (?! ), Epiduo and Hydroquinone. Epiduo is the new popular prescribed topical in the world of Acne. Remember when Differin was in? Tried it. It was poop. However, when he mentioned Hydroquinone, I scratched my head - never heard of it. 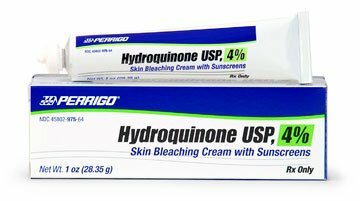 Hydroquinone is the by-prescription-only bleach cream. I have bad scarring from picking my pimples (nothing feels as good as popping a zit), so doc recommended I use the cream to lighten my dark spots because it will fade them quicker. I plan on only using it at night because I'm scared what will happen to my face after I apply it and then expose my skin to the sun. I also plan on using the tiniest amount possible and stopping once I see a good or bad change in my skin. Thoughts? Do you use bleaching cream or something similar? *Editor's Note (7/3/10) : I've been too scared to use the cream. It was a waste of money. It cost over $100 because it wasn't covered by my insurance. WASTE! I've been using Bio Oil on and off for over a year now and I'll just stick to that.